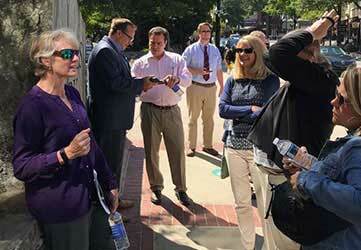 An entourage from the City of St. Charles, St. Charles Park District, the River Corridor Foundation of St. Charles and the St. Charles business community are visiting the highly successful Falls Park project in Greenville, SC to understand their planning, financing, management and formula for success. This trip will provide valuable insight as to how we might bring the same energy, vitality and excitement to our downtown. Stay tuned...! 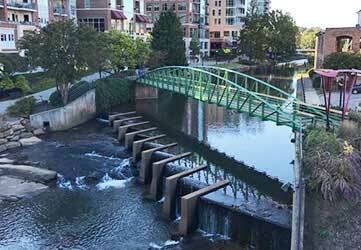 Removing a highway bridge that hid the Reedy River falls triggered +$400 million in new downtown development. 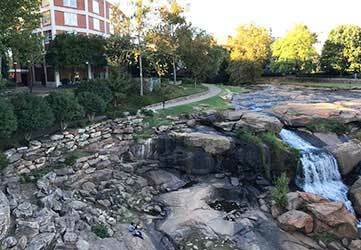 Greenville now enjoys over 1.0 million visitors a year to view and enjoy Falls Park. 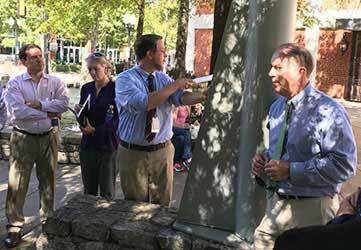 St. Charles aldermen Ed Bessner and Lora Vitek, Cathy Camm of the St. Charles Park District and Craig Larsen of the St. Charles Chamber of Commerce benefit from a walking tour of Falls Park led by Greenville Mayor Knox White and representatives of the Parks and Recreation Department. Greenville Mayor Knox White (right) welcomes the St. Charles delegation with true southern hospitality. 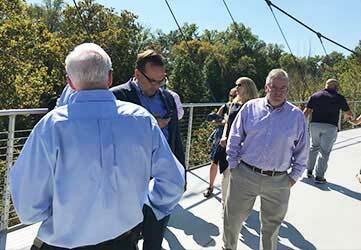 Bob Carne and Cathy Camm of the St. Charles Park District and St. Charles alderman Ed Bessner enjoy the view from the spectacular Liberty Bridge over Falls Park. 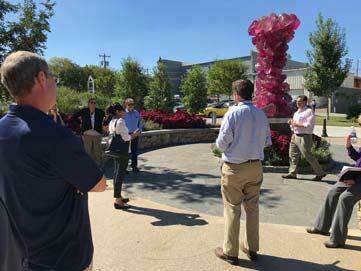 St. Charles Community Development Director Rita Tungare, Alderman Ron Silkaitis, St. Charles Parks Director Holly Cabel, Jon Wills of WBK Engineering and Craig Larsen of the St. Charles Chamber of Commerce view one of the many sculptures that are integral to the Falls Park and downtown Greenville experience.